Variable speed panels offer the ability to use three phase industrial duty motors in single phase residential applications. These panels allow the home owner more control over the flow and feel of their water feature. It is also a well known fact that three phase motors are far superior to single phase residential motors because they are more efficient than single phase, they last longer than single phase motors, they have only one moving part which reduces wear and increases longevity. No light dimming inrush current. Pump "soft starts" and "Soft stops", reducing water hammer and extending the life of your pump. Superior motor overload protection as well as voltage and power loss protection. Senses faults and shorts circuits and shuts down the pump in microseconds to prevent irreparable motor damage. Senses pump clog and will shut the motor down to prevent damage. Ability to slow down motor at night realizing substantial power saving while maintaining critical circulation. Much larger motors can be used in residential applications. Gives owner the ability to vary the speed of the pump achieving different look and noise levels in a feature. Takes the place of multi- speed motors and or valves when used for water effect. 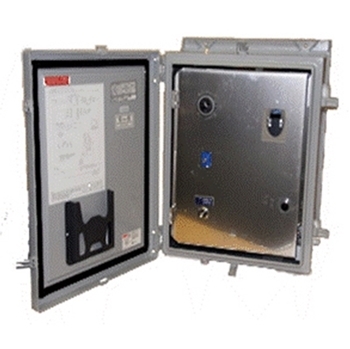 Nema 4X weather proof enclosure. 24 hour timer to control on/off or high/low speed functions. Dead front cover to protect from inadvertent shock. Speed knob for variable speed control. Terminals for incoming power and pump connections. On/Off/Auto switch for manual control or timer operation. Dimensions: 10" x 16" x 10"